The Cliffs of Moher are resoundingly beautiful. They are a stark and foreboding reminder of the power of nature and their juxtaposition against the stark landscape of Western Ireland can only be described as breathtaking. But as you wander the wind torn landscape you can’t help but feel they are also deadly. I felt this as clearly as I had ever felt the whisper of death as I walked on the cliffs last month. Looking down, I became profoundly aware that one misstep would lead to my death. As I clutched my son’s hand, I was even more aware that he could fall and I would never see him again. Without even knowing the Cliffs are haunted, I knew the cliffs were haunted. I knew that over Ireland’s long and ancient history death must have been engraved in the history of the cliffs. I wasn’t wrong. Stories of sorrow and tragedy cling to the cliffs like they do to Golden Gate Bridge. The cliffs have many ghosts and legends. I found numerous stories of death surrounding the cliffs. One story came from a young man who described the numerous suicides he has seen on the cliffs at Irish Central. The young man had worked at the Cliffs of Moher and the years had shown him that many people go there to end their lives. He was particularly moved by a woman whose story he hear after he saw her body drifting in the tide in a red dress. "I have reported down the years on some of the suicides at Moher. I have seen a couple of bodies away down below in the surf line after the events. One sight that stays with me is that of a female body wearing a bright red dress, tossing and turning in heavy seas which prevented the rescuers from reaching her. I will never forget that sight. Her story later emerged and it was almost standard for the scenario. She was a middle-aged Dubliner, with no mental or personal problems her family and friends were aware of, and she traveled down to Moher as a passenger on a coach tour. She was missing when the party boarded the coach again after viewing the mighty cliffs and enjoying one of the most scenic vistas along the Wild Atlantic Way that has been so successful as a tourist attraction in recent years. There was no warning for anyone who traveled with her about her dread intentions." 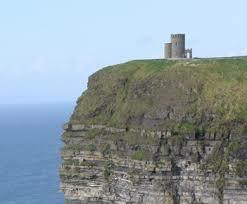 EMG.com ranks The Cliffs of Moher as the tenth most deadly place in the world you can visit. 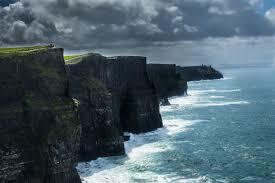 It is not surprising that the cliffs’ beauty have been inspiring myths and legends for millennia. Since humankind first glimpsed the beauty of the cliff's tales have been told of them. At Hags Head, there is a tragic legend of a witch named Mal who fell in love with the hero Cuchulainn. Apparently, love spells are useless, even in legends, and Mal’s love for Cuchulainn was unrequited and so she was doomed to follow Cuchulaiin through Ireland without any hope of gaining his love. Mal chased her love to the Hag’s Head and there Cuchulainn leapt to a small island. Mal was unable to follow him but tried and died at the feet of Hag’s Head. According to legend, she was turned into the face of Hag’s Head to remind young lovers to avoid chasing foolish love. Many mythic beings met their demise at The Cliffs of Moher. At the Cliff of Foals, the mythic gods the Tuatha De Danann met their end. The Tuatha De Dannann ruled Ireland for countless centuries and served as the inspiration for Tolkien’s Elves. Sadly, Saint Patrick brought Christianity to Ireland and Christianity drove the old gods from Ireland. Near Foal’s Head they transformed themselves into horses and hid in a cave near the cliffs. After centuries they emerged from the cliffs and were blinded by the light and fell into the ocean. The Cliff is still named for them. The Cliff of the Foals. Another tale speaks of the lost city of Cill Stuifin. The city sank when the king lost the golden key that opened the door to his castle. It is said that you can see the city off of the coast every seven years. If you keep site of it, you can walk to it, but if you turn away it will vanish in the mist. O’Brien Tower is one of the most notable man made structures on the cliffs. O’Brien’s ghost is so famous that he is even featured in the local Halloween party. Many of the tales that surround the cliffs are legend, but you can’t help but wonder how many of those who have died at the feet of these deadly cliffs still make their home with the Tuatha De Dannan in the mists of the Cliffs of Moher.